A couple of years ago, Keni Thomas was recommended to us as an artist, and we're thrilled that he agreed to join the Shibe team. He has designed a string of absolutely terrific shirts for us, everything from Ben Franklin to Wilt Chamberlain. We were overjoyed when we found out that he had been one of a handful of artists selected for Nike's Sneaker Lab project. He designed three shoes, all of which can be purchased online. So I asked Keni a few questions about how he got started in art, who inspired him, and a little bit about the project. 1.When did you first get into drawing? Was there a teacher or friend who inspired you, or was it something that you just got into on your own? I started drawing when I was 8 years old. I loved the drawing style of Jack Kirby (Marvel Comics), Todd McFarlane and political cartoons. I grew up trying to copy their styles. As far as teachers or friends, I had a neighbor whose grandson was a professional designer/ illustrator. Every time he visited he’d show me little drawing tips and tricks. These ended being the building blocks of my drawing style. 2. Tell me a bit more about your art background. Did you go to school for art? What do you do professionally, full time? I attended the Art Institute of Philadelphia for Graphic Design but adapted my drawing style independently. A few jobs after graduating college I ended up working for 3601 Creative Group, (In-house for Wells Fargo Center) in which I was the staff illustrator. In that role I did spot illustrations for Drive Magazine, all the kids activity books for the Flyers, Sixers, Wings and Bowie Baysox (Orioles AA affiliate). 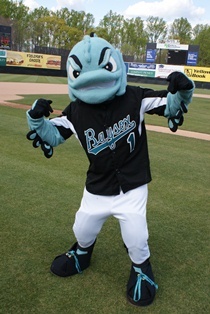 The high point was creating the Baysox’s alternate mascot, Rocko the Rockfish. Currently, I am head of the art department at GuestCounts Hospitality. GCH is the parent company of Cuba Libre Bar and Restaurant. I tend to hand draw a lot of pieces for advertising as well as chalkboard menu design. 3. What would you tell someone who wanted to take art from a hobby to a profession? The best advice I can give anyone wanting to take the leap from hobbyist to pro is to draw all day everyday and to utilize social media to find and cultivate an audience and clients. It was this step that sharpened my illustration skills. Finding an audience motivated me to draw more. I have drawn and posted a new illustration everyday for the last 7 years on Instagram (you can follow Keni's terrific IG page here). I would advise this method to all developing artists. 4. What makes you most excited and most anxious about the future of the Philadelphia art scene? The thing that excites me the most about the future of art in Philly is the wide and beautiful collection of artists in the city. The street art scene alone shows a very fertile and creative environment of non-traditional thinkers. Everything from yarnbombing to wheat paste posters, the state of the arts in Philly is extremely strong. 5. Tell us a bit more about this Sneaker Lab. Project. What is it? How did this gig come about? What's unique about this project? The Sneaker Lab project is a startup that pairs Nike with a small collection of artist and designers. Their goal is to create original set of shoes based on the artist style and vision. Once the shoe concepts are made they’re available to the public for three weeks. The shoes come in a custom package with an artist signature card. Essentially making the shoes limited edition collectables for sneakerheads. I found an online application for the program through Instagram. I applied (for the Hell of it) and was one of five artists selected. We were chosen from 7000 applicants! So, the last few weeks has been about creating a vision, selecting a shoe to work with and making them into finished collectable items folks would be proud to own. I decided to base them on my three favorite old-school rappers and color schemes inspired by my favorite sports franchises. This whole experience has been a great honor and a ton of fun.